Is Sinisefans.org updated now? it has a lot. I wish Sinise Mania and the EZ board group hadn't died. gsinise gets few posts That's why FB is cool and I don't want it ruined by wierdos. I just checked. It does not look like it's been updated. That does make sense as to why they aren't as picky with people posting. I have noticed that he/his staff don't post that much on FB or even twitter. I'm still getting used to that btw. I am a bit nervous about the fisical cliff that we might go over because I'm not sure GS is going to continue with the band if he pays their way and everything for them. I know he's rich but it does add up. EDIT: Should we come up with a new name for number 9 thread? 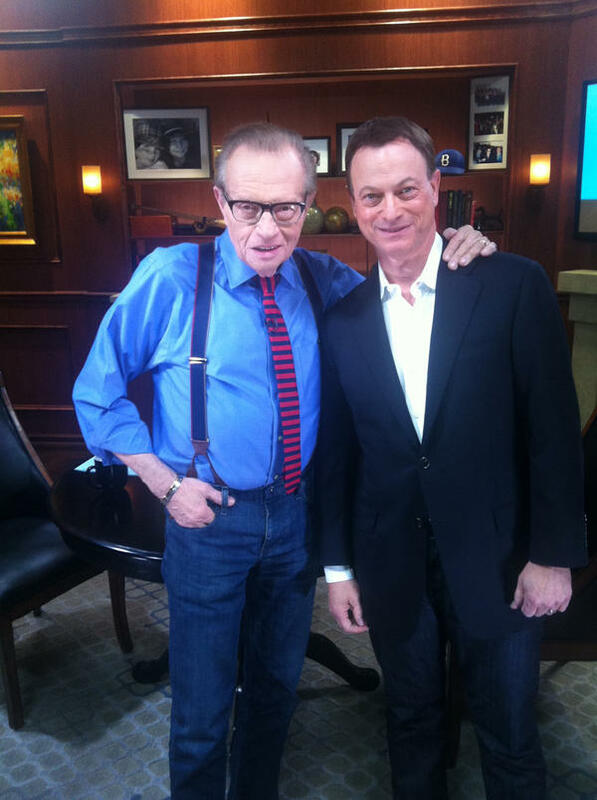 Looks like Gary did an interview with Larry King that is going to air in February. I hope this is an hour long one and not a 4 minute interview. I just hope he tweets or posts a reminder when the interview will air. Still getting used to him not tweeting/posting on FB as much. I know he's busy but he can't be that busy. I wonder if this will be on CNN. Gary posted a twit pic.. Too cute NOT to post. Gary is such an angel. So handsome and caring. Great pics everyone. Saw this posted on GS' FB page and thought it was interesting. When Gary Sinise and a small group of friends first started Steppenwolf Theatre Company in the basement of a church in Highland Park, they each took whatever day jobs they could find to support themselves. Sinise's wife worked as a bank teller at First Bank of Highland Park. Sinise, the actor and musician known for his roles in movies like Forrest Gump and television shows like "CSI: NY," worked as a groundskeeper at Ravinia Festival. He remembers spending his days raking leaves and cutting grass on the festival's renowned lawn. "That's what's cool about going back there to actually play on the stage," Sinise said of his upcoming performance with his Lt. Dan Band at Ravinia on June 13. "Ravinia is certainly a place where I grew up living and working." In an interview with Patch on Tuesday, Sinise discussed memories of growing up in Highland Park in the early '70s and attending Highland Park High School, where he was inspired to pursue a career in acting. "That's where it began," he said. An admittedly lackluster student academically, Sinise was resigned to skating by in school and pouring his energy into playing bass for his rock band until a chance encounter in the hallways with drama teacher Barbara Patterson. She told Sinise he should audition for "West Side Story," which she was directing. He got the role of Pepe, one of the Sharks. "I fell in love with theater at that moment," Sinise said. "Once I did that, all I wanted to do was plays." Sinise was excited to hear that FOCUS on the Arts, which existed when he was a student, would be beginning again this Friday at HPHS. His father gave a master class in film editing when he was a student, and he himself remembers running around to ten different events during this multi-day block of master classes and explorations of the arts. "It's great they still have it," he said. Sinise graduated from HPHS a few years later, and proceeded to lay the roots for what would become one of the most lauded theatre companies in Chicago. Steppenwolf began first in a space inside a Unitarian church in Highland Park before moving to the basement of Immaculate Conception. When the budding company began putting on shows, the First Bank of Highland Park advertised them on their marquee sign. "The roots of Steppenwolf are very much in Highland Park," Sinise said. Sinise's parents, as well as the parents of others involved in the project, contributed supplies to help make the room a performance space. Some donated old furniture. One parents contributed a bunch of different colored burlap that became part of the sets. "At that time, it was pretty much parents just helping their kids out," Sinise said. Once the reviews started coming in, however, that all changed. In 1976, if you wanted to see a Steppenwolf production you had to pay a whopping $3 per ticket. In 1974, when the company was first starting out, tickets were free. Sinise would put one of his old shoeboxes out and hope for donations. "Some of our shows didn't get anybody, and nobody would show up and we'd throw a party," Sinise said with a laugh. "We stayed at it. I don't think anybody could really predict that we could keep going and last." Eventually, newspapers like the Tribune and the Chicago Reader started running positive reviews, and Steppenwolf started gathering a following from the city. Soon that following was strong enough that it made sense for the group to move into the city. "Now we have our own building in the city that we built," Sinise said about Steppenwolf's Halsted location in Chicago, "and there you go." The show Sinise will be bringing to Ravinia fans this summer is one he has brought many, many times to American troops stationed in Iraq and Afghanistan over the past decade. He went on his first USO Tour in 2003 to Iraq and went on a lot more after. In 2011, Sinise started the Gary Sinise Foundation to support the country's veterans, first responders and their families. Proceeds from performances by the Lt. Dan Band go towards the foundation. "The roots goes back to that first tour in Iraq," Sinise said. So what can Ravinia attendees expect from the Lt. Dan Band in June? A lot of notable rock and roll covers that, when performed by one of the most notable fictional veterans, makes for "a very entertaining show." "I don't want people to just sit there and listen to cover tunes," Sinise said. "Come engage with the band and rock out with us… I know that they will." Gary's doing commercials now for a camp called Camp Corral, it's run by Golden Corral, and it's a free camp for the kids of military families. I saw it on Military Channel, IDK who else is doing it. It'll be interesting to see what he does if CSI:NY is canceled. I kinda expect him to retire from acting and going around the country like he has full time. Really wish Gary had tweeted he was going to sing at the game today. Wonder if he had issues with fans by doing that so he doesn't do that anymore. I don't remember who had #10 on the Cubs, or is Gary trying to send everyone a message with that number? Ron Santo I think. Not sure why he wears number 10 unless he's a big fan of Ron. Saw a tweet by Gary that just made me giggle. I wonder if he is at home. Not sure he would go to a hotel pool and be bothered by lots of people who might recognize him. Btw, it's been hot here in San Diego so if he is at home, I'm sure it's hot up in Los Angeles. Too bad, I'd take a dip with him....would love those pics too. Shirtless and all wet....:drool: wheee it got hot in here. But home would better. Btw he is in the Saturday Evening Post this issue, if I can find one or get it digitally. I did a search for GS pool on twitter search and it's funny to see people ask for pictures of him in his bathing suit. At least we have an onscreen one. Darned ipad wont give me the pic url but it's down the page a bit.